Play almost any card game in the world! We give you a virtual deck of cards for you to play the card games you love with up to four friends. If you choose to download the game, simply double-click on 'cardpyong.jar' to start it. You need to have Java installed. The first step to start playing is to create a new account if it's your first time here. Click on Login and enter your credentials if you already have an account. Click on New User to make a new account. Click on Login as Guest if you don't want to make a new account. You will be assigned a random username. You can chat with other players in the lobby using the chat box. 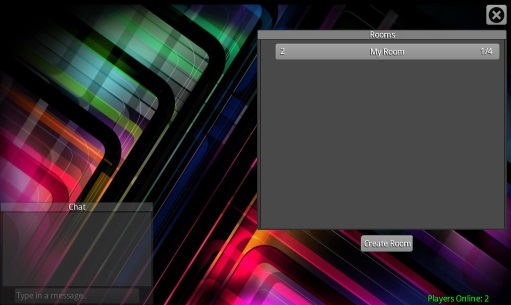 You can make a new room by clicking on the Create Room button. When creating a room, you need to specify the room name. If you want to make a private room, you can include a password. You can join a room by clicking on one of the room buttons. 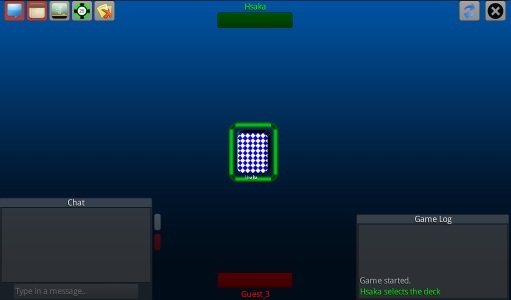 Rooms can hold a maximum of 4 players. If you create a new room, you become the Room Master [M]. The Room Master has the ability to setup the game before it starts. 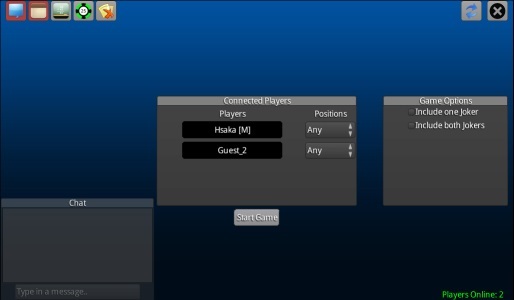 The Room Master can assign players into positions - Top, Bottom, Left or Right. If the 'Any' option is selected, then player positions will be assigned randomly. The Room Master can also setup the deck of cards by, for example, including one or more jokers. Card Pyong gives you a deck of cards and allows you to do almost anything with it. Shows/Hides the chat box - This chat box allows you to chat privately with a player in the room by clicking on the player's colour next to the chat box. Shows/Hides the game log window - Shows all of the actions performed by players in the room. You can check here to see if a player is doing something that they shouldn't be doing. Shows/Hides the game score window - You can keep track of scores here. Type in the scores in the score boxes and press enter. All players can edit these. You can also use the coloured boxes next to a player's name on the table to keep track of scores. Shows/Hides the item box - Allows you to add various items to the game such as money, chips etc. for the games that use those things. Shows/Hides all windows - If you prefer to see as much of the table as possible, you can hide all the windows. Resets the game - This option is only shown if you are the Room Master. Use this if you want to play a different card game. Return to the lobby - Leaving a room will disrupt a game that's in progress. The deck can only be controlled by one player at a time. To select the deck, you can click on it. The selected deck will be highlighted in the player's colour and the player's name will be shown under it. The deck can be dragged around the table. Click anywhere to deselect the deck. 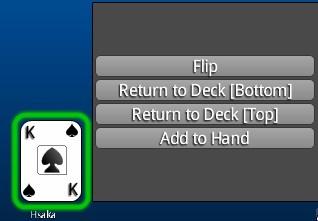 To perform actions on the deck, you can right click on it to bring up the action menu. Shuffle Deck - randomly arranges the cards in the deck. Deal Cards - puts the deck in deal mode. In this mode, you can deal cards to players by flinging cards out of the deck or by right-clicking anywhere on the table to throw a card at that position. Move - puts the deck in movement mode. This is the default mode for the deck and is only shown when the deck is in Deal mode. Flip top card - Pulls the first card from the deck and flips it face up. Take top card - Pulls the first card from the deck and adds it to your hand. Draw top card - Pulls the first card from the deck face down. Draw bottom card - Pulls the last card from the deck face down. Scatter cards - Randomly flings cards from the deck either face up or face down. A card can only be controlled by one player at a time. To select a card, you can click on it. If you want to select multiple cards, you can drag you mouse to draw a box around the cards you want to select. You can also hold the Ctrl key and click to multiselect. The selected cards will be highlighted in the player's colour and the player's name will be shown under them. Cards can be dragged around the table. They can also be flung around. Click anywhere to deselect the selected cards. To perform actions on a card or group of cards, you can right click on it to bring up the action menu. 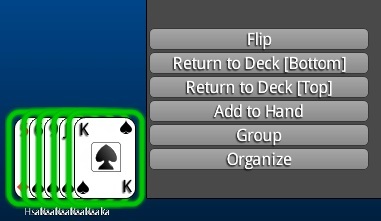 The actions will differ depending on whether a single card or group of cards is selected and on whether the cards are in the player's hand. Flip - flips the card(s) either face up or face down. Return to deck - returns the card(s) either to the top or bottom of the deck. Add to hand - adds the card(s) to your hand. Once you've added cards to your hand, only you can see and use them. No other player can touch your cards. A hand icon will be appear above cards that belong to a player. Remove from hand - removes the card(s) from your hand and flips them face down. Play - removes the card(s) from your hand and flips them face up. Use this to play your card. Group - arranges the cards in a stack. Organize - arranges the cards in a row in order by suit. 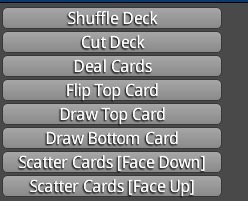 You can access most of the menu options for both the deck and cards by using the following shortcut keys. Deal Mode - Once the deck is selected, you can right click anywhere on the screen to deal cards. 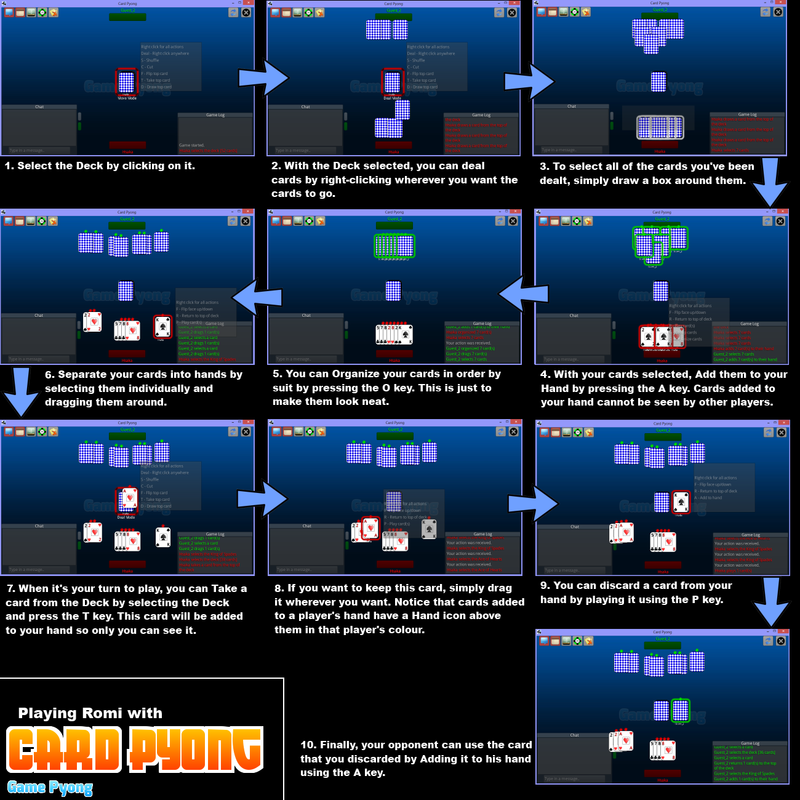 Here are some gameplay flows of various card games being played with CardPyong. Card Pyong is a multiplayer online game, and as such, there are certain rules which must necessarily be imposed on players to facilitate the smooth running of the game and the enjoyment of the game by all players. Violation of the Terms of Service may result in a temporary or permanent ban at the sole discretion of an administrator. © 2019 GamePyong.com All Rights Reserved.